This is probably the first horror film from the sound era that stands the test of time as a great piece of cinema (unlike its predecessor DRACULA, which retains its classic status in spite of its cinematic shortcomings, mostly on the basis of Bela Lugosi's performance in the title role). This rather truncated and altered adaptation of Mary Shelley's famous novel benefits from excellent big-studio production values (courtesy of Universal Pictures), especially some fabulous sets inspired by the German Expressionist films of the 1920s. Director James Whale stages the action with considerable skill, his mobile camera showing off the atmospheric settings and capturing the cast's performances, while never settling into the stodgy, uninspired point-and-shoot style of many early sound films; in a rather amusing conceit, he occasionally even has his camera move though walls to follow the actors as they move from room to room. And of course, Boris Karloff provides a remarkable performance as the nameless monster known to millions by the name of his creator, Frankenstein. Karloff's brilliance is that he makes the mute character into something more than just a shabby monster: he projects suffering and pathos that invites audience empathy, even while never undermining the menace - a trick that often eludes filmmakers trying to create a "sympathetic monster." FRANKENSTEIN was given life in response to the success of DRACULA earlier the same year. Looking for another horror project, Universal Pictures secured the rights to the Mary Shelly novel and a stage adaptation by Peggy Webling. The script that eventually evolved bore little resemblance to the source material, except for the basic idea of a man called Frankenstein who brought an artificial being to life. Shelley's novel, subtitled "The Modern Prometheus," is a sort of philosophical exercise that is little interested in the mechanics of suspense. The horror arises mostly from the concept of the "workshop of filthy creation," in which medical student Victor Frankenstein assembles a being from bits and pieces of dead bodies and from the horrible events that are set in motion when Victor carelessly abandons his creation to the whims of fate. Having managed to educate himself, the monster returns like a nightmare that refuses to die, demanding the Victor supply him with a female counterpart. When Victor refuses, the monster takes revenge, killing Victor's friends, family, and fiancé. Victor then pursues his creation to the North Pole, but he dies from his exertions. Vowing to terminate his own existence in a funeral pyre, the monster is last seen disappearing "into darkness and distance." As Leonard Wolf has persuasively argued in THE ANNOTATED FRANKENSTEIN, Shelley's novel is not -- despite conventional wisdom -- science-fiction. Victor Frankenstein is not a mad scientist; in fact, he is barely a scientist at all. Although he refuses to divulge exactly how he managed to create life, his studies, which include an interest in alchemy, suggest it was through some sort of magical-chemical means. Shelley herself (who was living with the iconoclastic poet Percy Shelley, whom she later married, at the time she wrote her book) was an atheist who avoids mention of the word "God" in her text and had little or no interest in delivering a message that there should be limits on human knowledge or experimentation. If anything her book is a metaphor for the callous disregard men hold toward birth and child-rearing: like an ardent lover, Victor passionately pursues the act that will create life; then once the act is consummated, he immediately abandons his "child." Victor's true sins are hubris and neglect, not transgressing on God's domain. 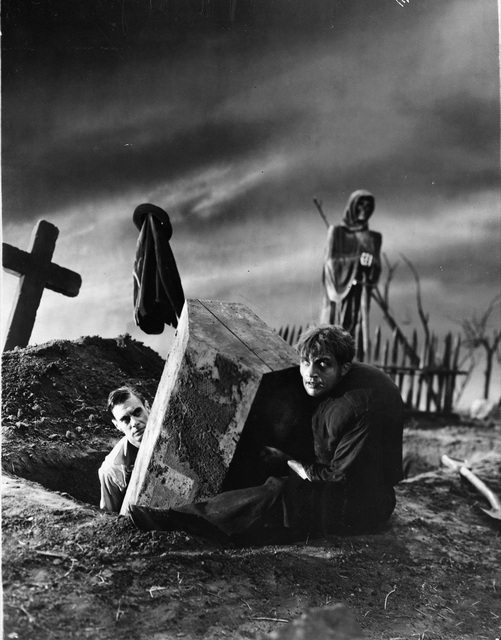 Frankenstein and Fritz gather raw materials. When Universal adapted the novel, they borrowed a few elements from the Peggy Webling play (such as renaming "Victor" as "Henry") and turned the story into the archetypal mad scientist tale of a man destroyed because over-stepped the boundaries of science while trying to play God. They also added a touch or two borrowed from DRACULA, such as making Frankenstein a member of the nobility: whereas the famous vampire was a Count, Frankenstein's father in this film is a Baron. The borrowings from DRACULA should not be surprising, as FRANKENSTEIN was a conscious effort at a follow-up. As fan magazines and film history books like to recount, Bela Lugosi was originally set to star in the film, under the direction of Robert Florey. 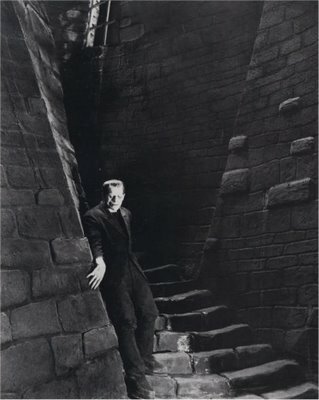 Unfortunately, Lugosi wanted to play Frankenstein, but Universal Pictures, who were looking for a new "Man of a Thousand Faces" (to replace late silent actor Lon Chaney, who had starred in their productions of THE HUNCHBACK OF NOTRE DAME and THE PHANTOM OF THE OPERA) wanted Lugosi to play the monster. 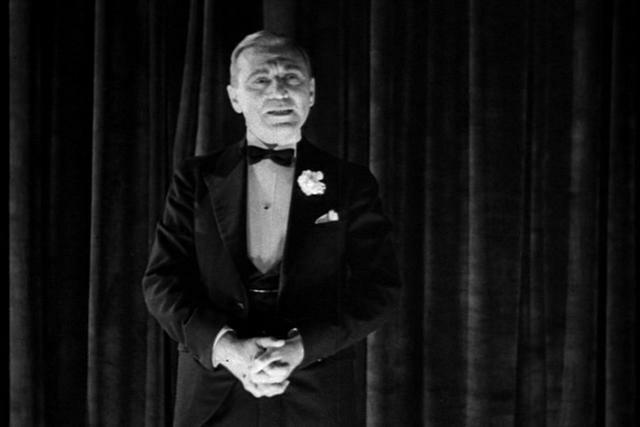 Test footage was shot with Lugosi in makeup, stomping around the leftover DRACULA sets, but the actor passed on the project and went on to work with Florey in MURDERS OF THE RUGE MORGUE, instead. Whale inherited actors Edward Van Sloan and Dwight Frye, who had played Professor Van Helsing and Renfield, the Count's mad henchman, in DRACULA. Their roles as Professor Waldman and Fritz, Frankenstein's hunchbacked assistant, were almost extensions of their previous characters. Whales selected Colin Clive to play Henry Frankenstein and Boris Karloff to play the monster. Clive's high-strung delivery perfectly suited a man so swept up in his own mania that he fails to foresee the potential consequences. Karloff, of course, humanized the monster in a way that turned what was intended as a supporting role into a star turn, creating one of the classic movie monsters. He was aided in this regard by makeup man Jack Pierce, who designed the look for Frankenstein's creation. Shelley's book only tells us that the creature's patchwork skin barely covered the working of muscles beneath its face, and Frankenstein laments that beautiful details like bright eyes and lustrous hair only underline the horrific effect of the whole countenance. Pierce's creation relies on a boxlike, flat-topped head and surgical scars, droopy eyelids, pale gray skin, and electrical bolts in the neck. Combined with welder's boots and padded clothing, the result was a classic movie image of a lumbering, ungainly giant, both pathetic and frightening. The movie itself, whose running time barely exceeds seventy minutes, is an extremely condensed version of the Shelly story, in which the monster never learns to speak. Also, some key points of exposition are fudged (the film never definitely tells us whether the towns people as a whole know that Frankenstein created the monster terrorizing the town of Goldstadt). As a result, the movie has a certain dreamlike feel in which events occur because they seem appropriate in a psychological sense, whether or not the plot justifies them. Thus, the monster manages to invade the Frankenstein household and menace Henry's fiancé (the somewhat matronly Mae Clarke), although it's hard to know how he managed to find his creator's abode with such perfect timing. The Monster (Karloff) stalks Frankenstein's bride (Mae Clarke). Despite its strengths, the film is not perfect. Mae Clarke is a bit drab as Henry's fiancé, and her relationship with Henry's friend Victor (whose clearly eager to steel her away from Henry) is a bit of pat melodrama. Director Whale, who evinced an increasing love for eccentric comic relief in his later horror films, contents himself here with the grumblings of Baron Frankenstein (Frederick Kerr), whose jibes and sarcastic remarks yield a chuckle or two (especially to younger viewers) but soon grow tiresome. Although hardly shocking by modern standards, FRANKENSTEIN remains an atmospheric mood piece with a genuine sense of creepiness, and it even manages to evoke the occasional chill of fear, as when the monster kills Waldman and later invades Elizabeth's chamber: the visual contrast between the virginal, whit-clad bride-to-be and the dark threatening monster is a classic piece of horror iconography, loaded with unstated sexual undertones. (Henry Frankenstein is such a nervous wreck that it's difficult to imagine him performing adequately on his wedding night, whereas the monster is strong and virile -- almost as if he were Henry's dark alter-ego.) Sometimes the studio settings are apparent (such as the painted backdrop for the craggy mountain scenes, filmed in the studio), but this only increases the Expressionistic feel of the film, opting for stylization over realism. 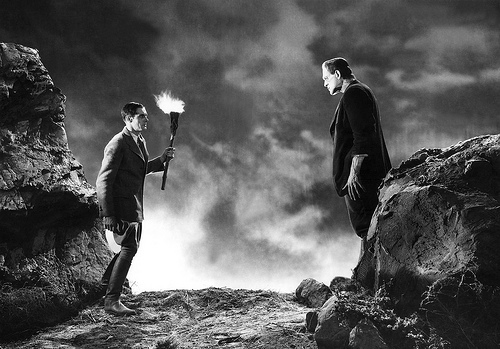 Ultimately, FRANKENSTEIN stands the test of time as a classic that is truly entertaining, not merely historically interesting. FRANKENSTEIN's predecessor, DRACULA, ended a scene of actor Edward Van Sloan stepping out of character to address the audience directly. Following up on this idea, FRANKENSTEIN begins with a scene of Edward Van Sloan, out of character, stepping from behind a curtain to warn the audience that the film they are about to see may horrify them. This sequence was removed from prints for many years but has been restored to prints currently available in theatres and on video, laserdisc, and DVD. It's also worth noting that the very first episode of the LATE NIGHT WITH DAVID LETTERMAN began with a parody of the Van Sloan introduction, with Larry "Bud" Melman stepping from behind a curtain to issue a warning to the audience about what they were about to see. When originally released, the film contained a line when Henry Frankenstein, upon seeing his creation come to life, shouted triumphantly, "It's alive! It's alive!...Now I know what it feels like to be God!" When the film was re-released, the line about God was deleted, and remained missing for many decades, creating a notable jump-cut toward the end of the creation scene. Eventually, the footage was restored, but the soundtrack remained garbled, with the line obscured by a thunderclap. Some prints in circulation retain this flaw, although recent DVD releases are supposed to have the dialogue intact. The monster briefly befriends a little girl - with tragic results. Also severely edited for many decades was the death of Maria, the little girl who innocently plays with the monster, showing him how to float flowers in the water. Running out of pretty blossoms to toss, the monster naively drops the protesting girl into the water, where she drowns. Anguished by what he has done, the monster lurches away, helplessly. 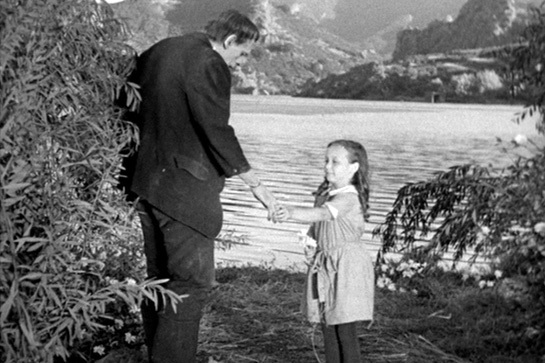 For many decades, the scene cut away at the point where the monster reaches for Maria, creating sinister implications when her father later walks down the street with her battered body in his arms (viewers might suspect she had been deliberately murdered, perhaps even molested). This cut was allegedly made at the request of Karloff, who did not like the way that Whale directed the scene: the actor claimed Whale forced him to fling the girl into the water, whereas he himself wanted to place her down gently. Now that the scene is restored, it hardly bears out Karloff's account. The monster may life Maria a little roughly (like Lenny in OF MICE AND MEN, he doesn't know his own strength), but the death is clearly an accident. John Carradine, a Shakespearian actor who detested being typecast in horror films, once claimed in a late night talk show interview that he had been told to visit the makeup department at Universal, when he was a contract player with the studio in the early '30s. There, he was told that he would be playing the monster in FRANKENSTEIN, but when he was told that the part had no dialogue, he refused to take the role. FRANKENSTEIN (Universal Pictures, 1931). Directed by James Whale. Screenplay by Francis Edwar Faragoh & Farrett Fort, from an adaptation by John L. Balderston, basedon the play by Peggy Webling and the novel by Mary Shelley; additional uncredited material by Robert Florey & John Russell. Cast: Colin Clive, Mae Clarke, John Boles, Boris Karloff, Edward Van Sloan, Frederick Kerr, Dwight Frye, Lionel Belmore, Marilyn Harris.